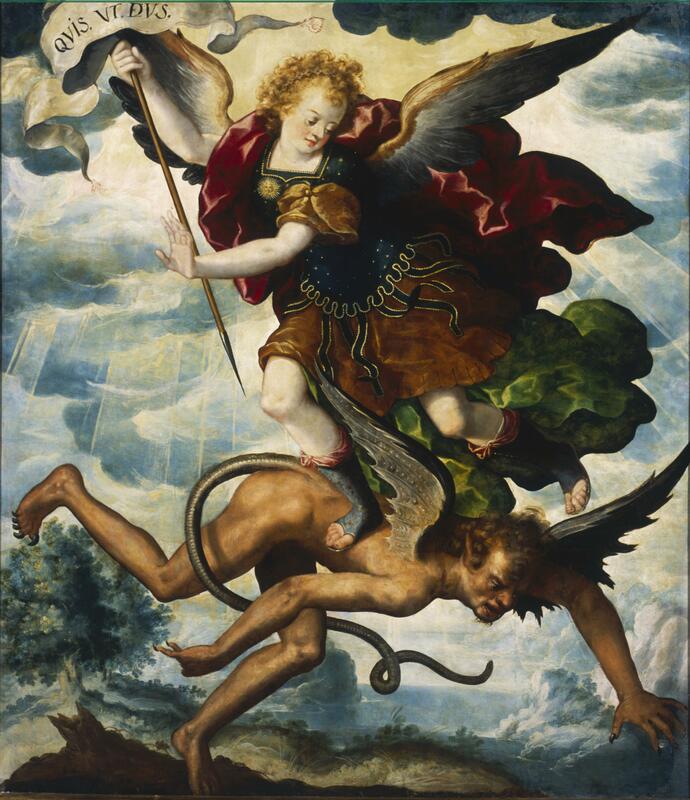 This dramatic painting of the Archangel Michael swooping down to do battle with the devil was created by one of New Spain’s leading painters, Luis Juárez. The scene derives from a passage in the book of Revelation where Michael defends the Woman of the Apocalypse, who was believed to be the Virgin Mary. Juárez was a master of the vivid narratives used to bring both biblical and other religious scenes to life. In this case, as in others, he was inspired by pre-existing European images of the scene, carried to the New World as printed engravings. Like many works created in New Spain, this one dealt with the end of the world as told in the Bible’s Book of Revelation. 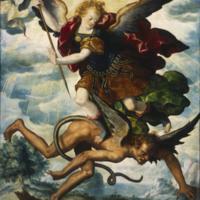 In this painting, the archangel Michael wears vaguely Roman military costume, as he battles the devil. Many believed that the conquest and evangelization of New World natives brought the world one step closer to the Apocalypse. The Latin inscription on the banner reads Quis ut Deus(“who is as God”), referring to the archangel’s role as God’s servant. The devil seems on the verge of toppling into the viewer’s space, and its painter, Luis Juárez, creates a vertiginous feeling both by the torque of the figures as well as the ambiguous ground line in the painting. This is made of oil on panel, and measures 172 x 153 cm. Burke, Marcus. 1990. ‘The Archangel Michael (Conquering Satan).” In Mexico: Splendors of Thirty Centuries. Pp. 301-303. New York: Metropolitan Museum of Art. Ruiz Gomar, Rogelio. 2006. “Saint Michael Archangel.” In The Arts in Latin America, 1492-1820. J. J. Rishel with S. Stratton-Pruitt, eds. Pp. 360. Philadelphia: Philadelphia Museum of Art, and New Haven and London: Yale University Press. Ruiz Gomar, Rogelio. 1987. El pintor Luis Juárez: su vida y su obra. Mexico City: Instituto de Investigaciones, Universidad Nacional Autónoma de México.